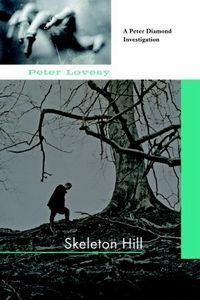 Skeleton Hill by Peter Lovesey, a Mysterious Review. Review: Detective Inspector Peter Diamond of Bath (England) assume the investigation of a cold case when a bone is found under an uprooted tree in Skeleton Hill, the tenth mystery in this series by Peter Lovesey. The bone was found by two "dead" soldiers during their participation in the recreation of a 350-year-old English civil war. When the police are notified of the discovery, members of the crime lab conduct a thorough search of the area and find the rest of the skeletal remains, minus the head, of a young woman. Further testing in the lab prove the young woman had been in her late teens or early twenties, and dead more than 20 years. Since the body was missing its head, a murder investigation is opened. There is no DNA or other indentifying clues that could ascertain who the young woman was, and her clothes had rotted away, save for a "zipper pull" from her jeans. A short time later one of the "dead" soldiers who found the original bone, a history professor, is found murdered, killed by a severe blow to his head. Could it be possible that these two deaths, so many years apart, have something in common? Lansdown, the site of the reenactment of the civil war and now the scene of two murders, sits on a hill seven hundred feet above sea level. It is windswept and isolated, a place where most would pass without stopping. Did Lansdown hold the solution to this mystery? Diamond and his team suspect foreign trafficking of teenagers to take place in the area. The skeleton of the young woman was the right age. Could she have been a runaway? But how is the murder of the professor related? Could the professor have actually been killed on the battlefield in the course of the reenactment with no one knowing? Diamond has to face the fact that he may have overplayed the possible connection between the two murders, 20 years apart. After all, coincidences happen. Life is full of them. Diamond's dogged investigation of the murders, and the tenuous link between them, keeps the reader guessing as to how it will all be resolved. The detective inspector and his team are intelligent, dedicated officers, who have an easy and credible camaraderie. This attention to characters who bring depth and interest to the story, together with a most intriguing procedural plot, make Skeleton Hill a "can't put it down" kind of novel. Special thanks to guest reviewer Betty of The Betz Review for contributing her review of Skeleton Hill. Acknowledgment: Soho Press provided a copy of Skeleton Hill for this review.